Built to last, our raft ladder is made with light weight high strength aluminum, UV resistant high-density polyethylene rungs and stainless steel hardware. It is made to deploy and stow in seconds with our innovative design and quick releasing buckle strap. Our all new Arma Coatings sprayed end caps bring an extra layer of protection to our ladders and to our customers. Arma Coatings is designed to last and will not chip, peel, or degrade overtime. 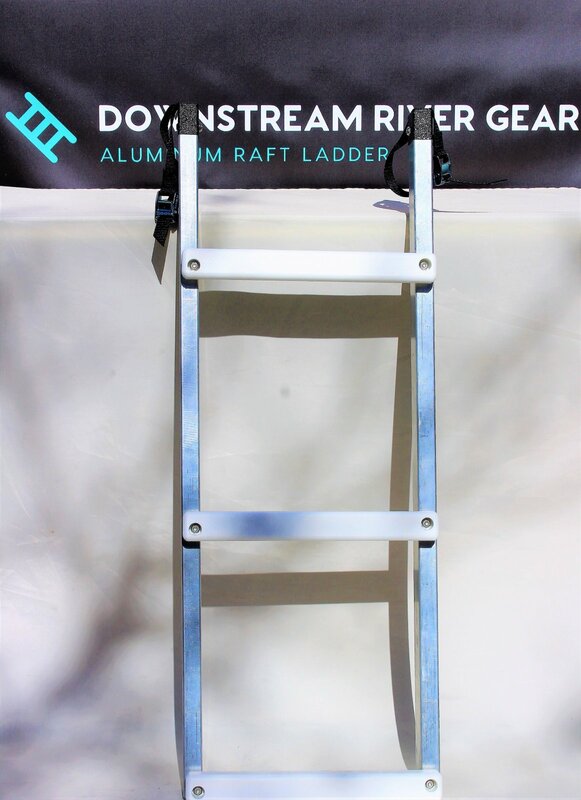 The ladder will easily mount on all raft frames in seconds with the two included 3/4 inch wide cam straps and our quick releasing buckle strap. If you have a custom frame with running boards and don’t have two tie down spots approximately 13 inches apart, you may need to add one.This ladder is simple to use and very sturdy. People of all ages will grow to love this product and it would be a great addition to any rafting trip! Easy in and easy out of the water. No more stress of getting passengers back into the boat! And a great way for the rower to enjoy a quick break in the river and be back behind the oars in seconds. When your boat is on the trailer our ladder is a great way to get in and out of the boat safely to make packing and unpacking more enjoyable. We love this ladder and know you will too! It is a must have on any raft! Use of this product requires skill and the exercise of caution: Children using this product should be properly supervised by an adult. Due to the nature of this product, the seller/distributor of this ladder assumes no responsibility for damage or injury which may be caused by the use of this product whether caused by accident, negligence, or otherwise. Each cam buckle is rated at more than 500 lbs. It is a total length of 35 Inches once un-clipped and ready to use with a width of 13 inches between side rails. 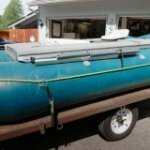 With the ladder secured to your boat in the folded position it is 2" x 3 1/4" x 47"